'Fast & Furious 7' races to a record breaking $143M Box Office Opening. I think the only thing that is a surprise about the 'Fast 7' box office opening weekend is that some people didn't go see it. With that said, Universal's "Furious 7" crossed the finish line this weekend with a record $143 million opening at the domestic box office. Not only is a $143 million opening completely unheard of for April (easily zooming by last April's record $95 million by "Captain America: The Winter Soldier"), but it's the biggest opening weekend so far this year. The $85 million opening of 2015's prior record holder "Fifty Shades of Grey" -- a film also released by Universal, a division of NBCUniversal -- seems miniscule in comparison. "Furious 7" also becomes the top opening in "Fast" series history, surpassing the $97.3 million of 2013's "Fast & Furious 6." New Action Packed 'Fast & Furious 7' Trailer Revealed. Thanks to the Super Bowl, we started this week off with an extremely badass new look at James Wan’s Furious 7, but that’s not all Universal Pictures has provided us this week. Tonight saw the release of a brand new trailer for the upcoming action film – and you can see it below! "This right here takes crazy to a whole other level." While that line by Tyrese Gibson’s Roman in this new trailer is a bit of a cliché, it’s also fairly appropriate for what’s on display in this new footage. After all, we not only get clips of both the airplane drop from the first trailer, and the car skyscraper jump that was featured in the Super Bowl spot, but we also get an incredibly badass fight between Dwayne Johnson and Jason Statham. Johnson vs. Statham, people! Video: First 'Fast & Furious 7' Trailer Revealed. After so many understandable stand stills (following the death series kick starter, Paul Walker), it seems like 'Fast 7' is set to rock out and honor Walker in theaters very soon. Recently, we revealed the first look at Hobbs (Dwayne "The Rock" Johnson) going up against Ian Shaw (Jason Statham), which was on fight that many fans have yearned for ever since the film was revealed to be happening. Fight Scenes For Fast & Furious 7 Has Been Revealed. Yesterday, we revealed a fight scene from 'Fast & Furious 7' film series. The fight was between Dwayne Johnson and Jason Statham. Now, Universal Pictures has release a full seven seconds of unfinished, behind-the-scenes fight scene footage from Furious 7. Its seven seconds of fake fisticuffs, entirely free of context. Enjoy. See the video embedded below. In addition, Universal Pictures also released two more videos. Furious 7 Cast Favorites - Fights focuses on the epic confrontation between Vin Diesel's character Dom and Dwayne "The Rock" Johnson's character Hobbs in Fast & Furious 5. The Road to Furious 7 - Fights highlights some of the best fights in the franchise to date. 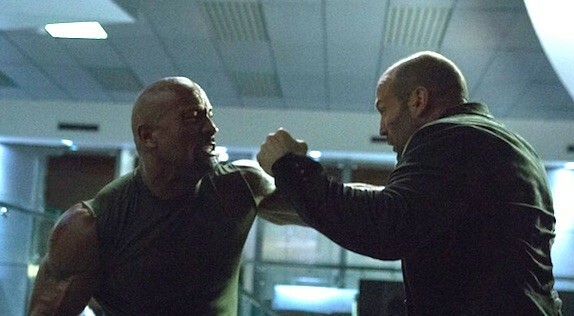 New 'Fast & Furious 7' Pic Revealed: Dwayne Johnson vs. Jason Statham. For a while now, many fans have been standing by patiently contemplating on what will be the future of the 'Fast 7' franchise after the death of Paul Walker. We'll as the months narrowed down, it was revealed that the film franchise will painfully keep going and 'Fast 7'will keep the memory of the franchise Paul Walker help start alive. Just a couple months ago, actor Vin Diesel revealed that the film was done shooting and it would be ready to be released on April 3, 2015. Just recently, the official poster for the film was revealed with the possible release date for the first trailer which is on November 1st. Fast & Furious 7 Trailer Release Date Announced and Poster Revealed. Universal Pictures has officially announced the first trailer release date for 'Fast & Furious 7,' and they are making quite an event out of the trailer reveal for the highly anticipated film. Here's the official announcement that was posted to the Fast & Furious Facebook page. Vin Diesel Releases Emotional New 'Fast & Furious 7' Pics That Features Paul Walker. Just recently, actor Vin Diesel shared a few film sstills from "Fast & Furious 7," which the cool stills not only give a new glimpse of whats to come in the film but it also shows that th film is still on track for its April 2014 release. Diesel also decided to tease details about the incredible trailer for the film, and also added that he hopes his late co-star, Paul Walker, would be proud of the work they’d done. After Dominic Toretto and his crew helped take down Owen Shaw, his brother Ian Shaw now wants revenge.